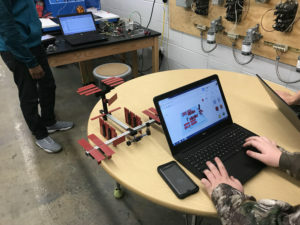 PINSON — Pinson Valley High School has been selected by the ARISS (Amateur Radio on the International Space Station) U.S. program to participate in a scheduled amateur radio contact with astronauts aboard the International Space Station as the ISS orbits over Alabama the week of April 9. Students Justin Burgess and Colin Auclair in a class at PVHS. Photo provided by Lensey King. Moore heard about the ARISS program through her husband, who is an active amateur radio operator and involved with the American Radio Relay League. PVHS decided to begin the yearlong application process for the program in Jan. 2017. The first stage of the application involved writing an educational plan, Moore said. “Several teachers worked together to write this plan, which outlined our goals for teaching STEAM (Science, Technology, Engineering, Arts and Mathematics), communications, and aerospace topics in many content areas,” she said. The educational plan was submitted to ARISS in April 2017. Once selected to move onto phase two, the PVHS staff had to create a technical and equipment plan showing that the school had the proper space, tech support and sightlines to host the event. This portion of the application was submitted in Aug. 2017. Contact to the ISS will be made from the school’s auditorium, with help from ARISS mentors Dr. John Klutd and Tim Cunningham, Moore said. Cunningham will bring amateur radio equipment and assist the students in making contact with the astronaut on the ISS. While the school’s auditorium will not hold the entire student body, Goggins said that they are hoping to be able to stream the event into classrooms to include students who will not be able to attend in person. Moore said that the goal of this program is to expose PVHS students to STEAM topics and job opportunities with Alabama’s aerospace industry.